The NC Center for Afterschool Programs [NC CAP] developed this statewide, searchable database for out-of-school time programs. Out-of-school time (OST) programs serve K-12 youth before school, after school, summers, weekends and during school breaks. Programs can take place in schools, school-age child care centers, community-based organizations, faith-based organizations, universities, libraries, museums, camps, and other locations. You can utilize this database to search for information on program locations, activities, number and grades of youth served. This database helps families, schools, communities and elected officials locate programs for their youth. It also aids in identifying community assets and gaps in out-of-school time programming. Use this searchable database to find an out-of-school time program by zip code, activity or grades served. Join NC CAP, North Carolina’s Network of Out-of-School Time Program Providers. Help families, schools, communities and elected officials find your program. It’s easy to let others know about you. 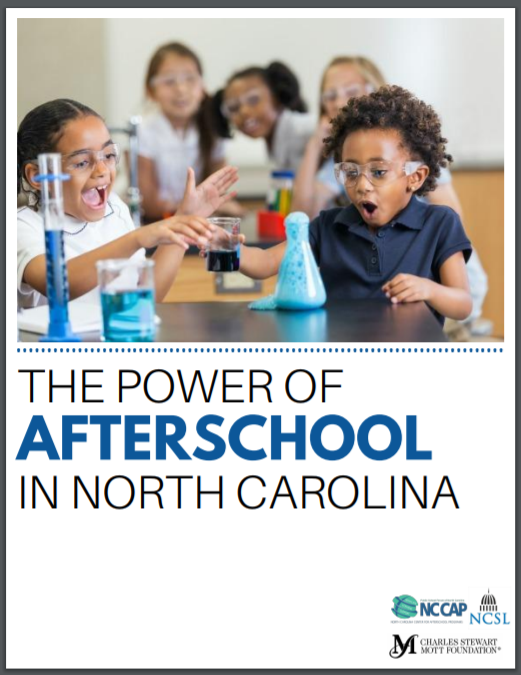 The Power of Afterschool in North Carolina Report was released at Lights On Afterschool NC in October of 2018. The annual report was developed to spotlight data that illustrates the afterschool landscape, both statewide and nationally. Statewide data is reflective of programs registered within the NC CAP mapping database of out-of-school time programs. National data was provided by the National Afterschool Alliance. The report was made possible by the National Conference of State Legislatures and the MOTT Foundation.